Found on the Sunday flea market in Sydney (where we met up with Adriana and had a lovely lunch). 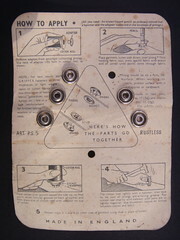 so has had a long journey all around the world, and just one of its gripper fasteners was used in Australia. "HERES HOW THE PARTS GO TOGETHER"
Another wonderful object sent to me by Angelica (I do not know how she can part with these wonderful things). I have many cards of snap fasteners (poppers) but this is the only one I have where they are stored in a tin "TUBE"
BOTH PARTS EXACTLY ALIKE IF ONE HALF IS LOST ANY OTHER FASTENER IN THIS TUBE WILL FIT . PERFECT DOUBLE SPRING ACTION. SNAPS FIRMLY - RELEASES EASILY. GUARANTEED WEAR PROOF. 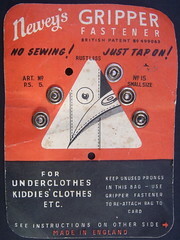 THINNEST FASTENER MADE MAKES GARMENT FIT BETTER. RUSTPROOF -FAST COLOR. EDGE CANNOT CUT THREAD." Close up of how the fasteners are stored in the tin holder. 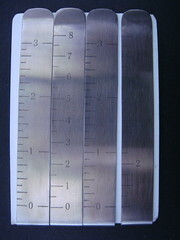 There is a ruler printed on one side of the tin, but I am unable to read what the other side says. Drawing of how it works. I found these today in the Cancer Research shop. For helping turn up the hems of skirts and turnups on trousers. 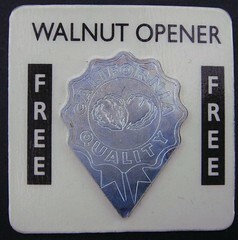 Simply insert the point of the opener into the base of the nut , and twist firmly. 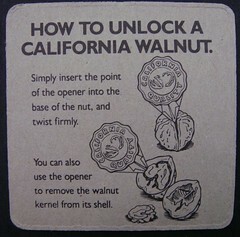 You can also use the opener to remove the walnut kernel from its shell. New year has sent me into a big sort out and tidy up mode. Whilst in this frenzy of tidying I found this envelope from Robin Crozier addressed to our Lambeth Walk address. 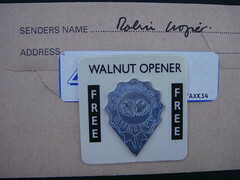 It seemed very apt to blog now for the post Xmas bowl of walnuts.